My favourite character is Rail, something about his sleazy deranged mannerisms charm me I suppose. What doesn't charm me is how difficult he is to find cels of, but I'm getting by well enough. As usual, I adore all of the characters, though, or most of them anyway. Yami o Makumono and Kali are fun and appealing villains. In a way I even felt some pity for Brain. Maybe not for Stargazer though. Canal's adorable for being the projection of a computer's mind, and Kain and Millie are easy enough to care about. Then there's bumbling Nina, who I have extreme amounts of pity for. Why? Because she has a crush on my favourite character, and my favourites are almost always not good types of people to have crushes on. Nina's not completely hopeless, as evidenced by her horn-biting prowess to the right. Essentially Lost Universe is an expansion of Slayers (I loosely consider it season 4). 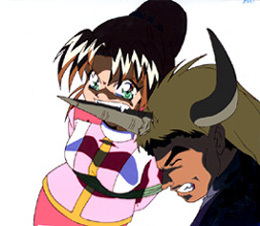 It's best to watch it after Slayers Try, because that's when the universe this tale happens in is first developed (remember Volfied, Dark Star, and the Dark Star weapons while watching!). Plus, a healthy knowledge of Slayers characters will lead to a far greater appreciation of their other-universe counterparts.